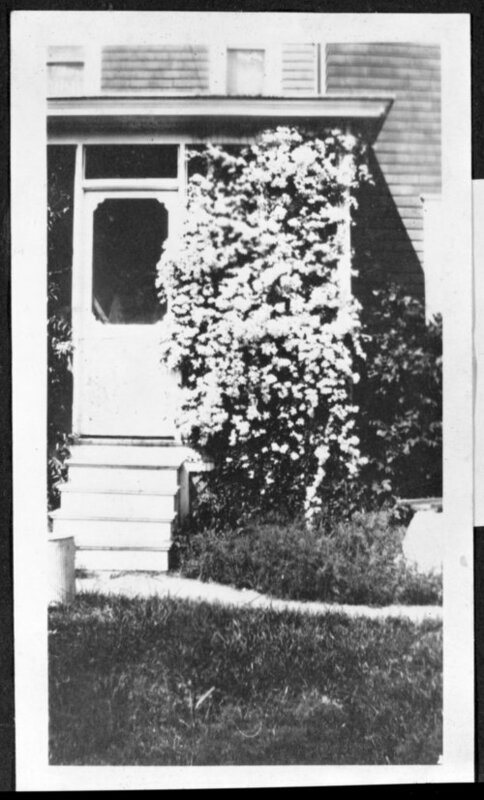 This black and white photograph shows flowers blooming on a trestle at the back door of the Rogler home. The homestead known as "Pioneer Bluffs", is located on 160 acres of land along the South Fork of the Cottonwood River basin, in the Bazaar Township of Chase County, Kansas. The Rogler family owned and operated the ranch from 1859 to 2006. In October of 2006 the historic property, which included the home and 4,081 acres of land, was auctioned off at 6.9 million dollars. Today, "Pioneer Bluffs" is a non-profit educational center that is dedicated to teaching the history of ranching and the diversity of the tall grass prairie.